High-Accuracy & Low-Maintenance Inspection - CMM Inc. 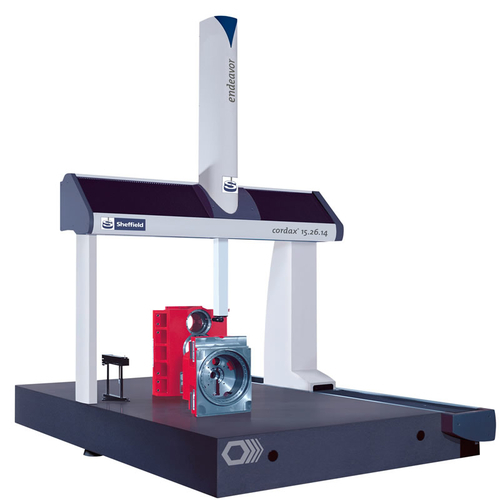 The Sheffield Measurement Endeavor 3 Coordinate Measuring Machine (CMM) offers nine standards sizes (ranging from 5.5.5 up to 12.30.10), additional models and improved accuracy performance compared to the previous generation. This cost-effective CMM is designed to address a wide range of dimensional measurement requirements. It also combines the versatility of tactile scanning, noncontact scanning, and optical imaging. Available in two models, The Sheffield Measurement Endeavor 3 and Sheffield Measurement Endeavor 3 Plus use advanced measurement software to provide efficiency, accuracy and advanced reliability to the user. Both models also offer a breakthrough design and verified construction and control technology. The Endeavor 3 is suitable for touch-trigger applications, while the Endeavor 3Plus uses tactile scanning probes, offering extensive sensor support for more challenging, non-contact scanning applications. The Sheffield Measurement Endeavor 3 CMM machine is precision-manufactured at Hexagon Metrology, the world’s largest manufacturer of coordinate measurement systems. Each unit is also checked and certified to meet application test procedures required by B89 and ISO standards. Selected custom sizes are available upon special request.